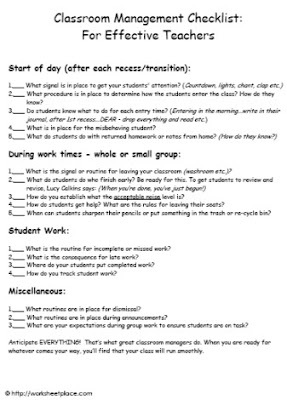 Need Some Help With Classroom Management? Want a great school year? Get a grip on your classroom management. Free tips and strategies right here at your fingertips. You really only get one chance to make that first impression with your students. If you had one of those years last year where you said to yourself 'Next year will be different, I won't do that again', then be sure to learn from those mistakes. I have some great tips and hints for you to excel at classroom management and discipline that have been used effectively by some of the most experienced educators. Learn from the best and you'll have a great year with your new students. Tip of the week: When your students are talking when you are, stop talking! Put the timer on. Each minute they take will need to be paid back. When the bell goes (hopefully you don't have supervision duty.) They pay back their time. By giving up a few minutes of your time, you will be teaching them that they don't speak when you are. If you begin raising their voice over them, you will be teaching them that it's okay to speak when you are. Some of our most effective teachers will tell you that this is a big no no. Learn from the best. Have a great teaching week!